On Friday morning I woke at 4 am to the house shaking. A pine had dropped a giant limb. It had missed our roof but hit the road. We still had power, and I had a new book idea. Just like that. I fell back to sleep and awoke to a blue dawn. My woods were enchanted. The white pines had grown straight and tall over a hundred years. They do not sway much in the breeze except when coated in ice. That morning the top-heavy tree swerved and dipped, as if land had become sea. Aboard my mudroom deck, I watched nature wage her battle. 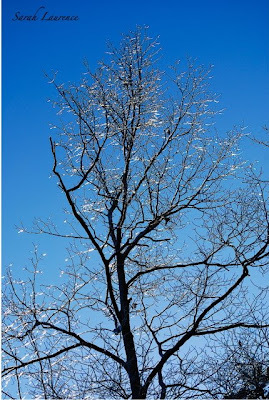 Loud as gunshot, branches snapped from great heights followed by the breaking glass tinkling of ice. There was the Christmas tree scent of fresh-cut pines. Window lights glowed orange, flickered and then were snuffed out. How musical, how beautiful and how deadly. Smoke blurred into mist as woodstoves were lit. We are prepared after living through the ice storm of ‘98. That was our first winter in Maine, and our small house had this woodstove set awkwardly at the base of the stairs. It seemed dangerous with a baby and a three year old, but we didn’t remove it. So many houses had these stoves; there had to be a reason. 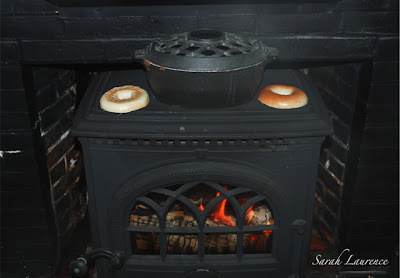 The woodstove kept our house in the 60’s and heated canned stew for a week with no power. Resigned to the latest storm, I curled up like a cat before the fire. The children were bouncing off the walls with excitement for a “snow” day. Other neighborhood children joined my lot to keep warm. 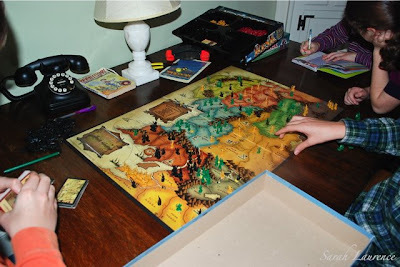 I was pleased to see the kids playing like I had before computers. By the time she’d finished “cooking,” work crews had cleared the road. The eaves were dripping icicle rain. The pines were now more green than white. It was safe to play ice hockey in our driveway. While the children were outside, I tended the fire and thought about the novel that I’d write after NOT CRICKET. By afternoon the sun was burning through the mist, and I’d chosen a working title. The story will have to wait its turn. When NOT CRICKET is ready for my first reader, I’ll use the down time to start my next project. The new idea is a bud encased in ice. 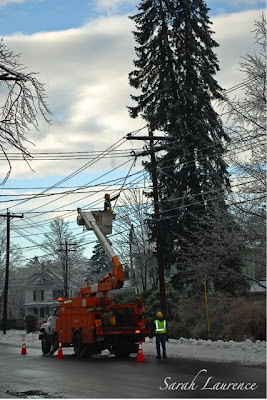 The children’s spirits rose to Christmas morning frenzy when they spotted Central Maine Power workers on the job. I was reading in the fading window light when I saw the hall glowing like sunset. I was sorry to put down my book and rejoin the digital world. One day without power is fun, but more than that is a burden. 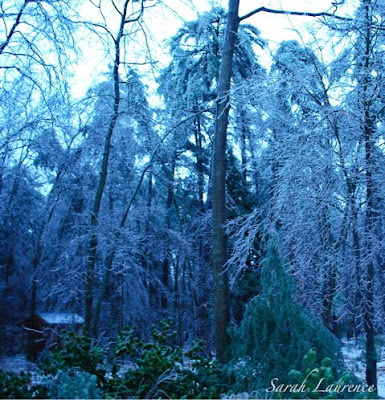 This ice storm robbed over a million people from Pennsylvania to Maine of electricity. Our neighbors across the woods were still without power days later. The hum of generators buzzed like lawn mowers on a summer day. By the next morning, blue skies had returned. The trees shined brighter than diamonds. If you can survive the storms, there is no place better than Maine for winter. Snow is in the forecast for today! Blog Watch: This post is the antithesis of Garden Bloggers Bloom Day. Check out the link to May Dreams Gardens if you've had enough blooming ice. Ice is so pretty. I'm glad you were only inconvenienced a day though. And that you are storm prepared. I love your daughter's ingenuity at coming up with a new dessert. It looks lovely and fresh tasting. Now that was an interesting day. The pictures of the woods under ice were great and your descriptions lyrical to say the least. 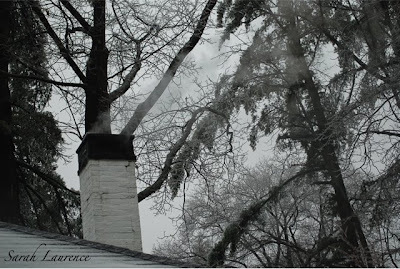 We had a Franklin stove in our old house next door and it came in handy many times after Minnesota ice storms as well. 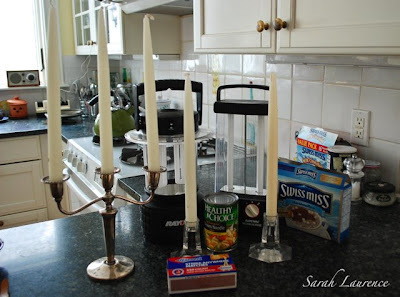 Sarah, that's a lovely tale about a day without power! Your daughter is so creative - I bet that dessert was yummy! And I'm so curious now as to your new idea for a novel...guess I'll just have to wait until you start writing it. 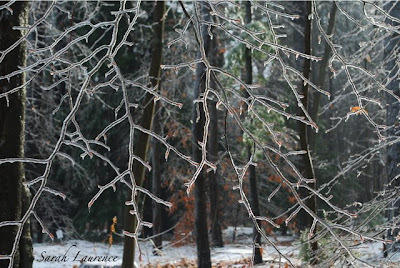 Ice storms; so destructive and yet so beautiful. Life's mirror image perhaps? Wood stoves were all we had for heat during winters when I lived down in Tucker Holler, KY. Whey you're a kid, splittin wood and choppin kindlin ain't no fun! I remember visitin our "Little Granny" and watchin her cook on a charmingly archaic wood stove. I can still picture her four-foot frame, hair in a bun enclosed in a net, round-rimmed granny glasses, feeding wood into that fire eating thing that so intrigued me as a little boy. Such beautiful photos! 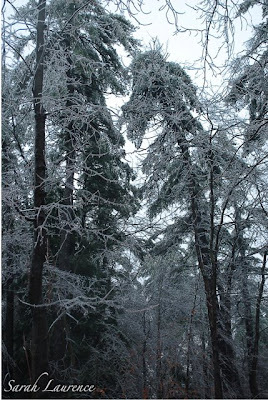 Ice storms create such beautiful scenes, but I don't enjoy the damage they cause. You were very lucky to get your power back so quickly. I wanted to apologize, Sarah--I meant to include a link in my last post about your Book Club Boost, but in the rush to finish it, I completely forgot. Looks like the ice storm has provided you with a new inspiration. Cindy, it’s such a contrast – the beauty of an ice storm and the damage it can inflict. In ’98 the fallen tree limb went through our roof. This recent storm was sweeter, desserts and all. Troutbirder, I hear it’s colder in Minnesota. It’s a good thing you kept that stove. Katarina (roses and stuff), I never got to taste the pudding as the girls gobbled it up. The new book idea is still only a seed. I’ll share it when it’s blooming. It’s hard not to think of it, but I must finish the book before it. TC, welcome to my blog! My boy stacks and carries the wood, but my husband does the splitting, especially when he has a stack of grading waiting in his office. Woodstoves are a lot of work. I have friends here you use them as their main source of heat. Your boyhood image of “little Granny” is priceless. Rose, we were lucky. My daughter is becoming the queen of our kitchen. Don’t worry about the link at all. It was fun reading the other book boost posts. Not anywhere as big at GBBD, but maybe the meme will spread. Inspiration comes in many forms. As usual I enjoyed your visual journey through that pinewood and could almost hear the storm raging in my ears. Yes, your daughter's definitely half-British :-). And it's funny how adverse conditions trigger off emotions and feelings that become the basis for poems, novels and articles. Good luck with you novel. Great to get inspiration from the ice storm. Good deal! You did a job showcasing Maine and the ice. I hope your tree fared well. ACIL, thanks! I’ve always found nature at her extremes the most evocative. 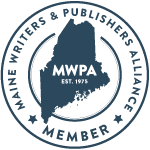 A lot of books set in Maine take place in summer, but the long winter has been a theme in my writing. Tina, luckily it was just a white pine, designed to snap limbs. Luckier still, it didn’t damage anything in the fall. Others weren’t so lucky. New Hampshire was harder hit than Maine. Stay warm and safe. I need to try the pudding. This was an absolutely magical post. Beautifully written - crisp and clear like your newly returned sun. Loved the British dessert. Congratulate your daughter for me. So thrilled that inspiration struck - odd how or where it appears from. You are right that the delights and rigors of returning to the pre-digital age do not linger for ever. We are still madly in love with our dishwasher having been without one in Maroc for 2 years......! Thank you, Yolanda. My daughter will be pleased. Elizabeth, thank you. When power came back, the first thing I did after checking my e-mail was load the dishwasher. I don’t know how you did without for 2(!) years. Thank you, Sarah, for inviting us into your cozy home. Congratulate your daughter for being so resourceful and creative. She must have had a good teacher. Hope your taste of winter's fury doesn't turn into a full-meal-deal. This was magical! Your pictures and your writing are wonderful. And congratulations on the new book idea! Thanks Sarah, I love your pictures! That ice looks really cool. Wow, beautiful pictures! It must be eerie when your woods start behaving differently than they normally do-trees that are normally rock solid dipping and swaying like that. Glad you came out of it unscathed. W2W, a fire does make a home cozy. My daughter’s cooking abilities must come from her father. We only got a couple of inches from today’s snow storm so this winter is breaking us in slowly. Thank you, Donna! A new book is always fun to contemplate. It's perfect in my head but a lot of work to get down on paper. Merci, Jacques, I admire your handiwork. 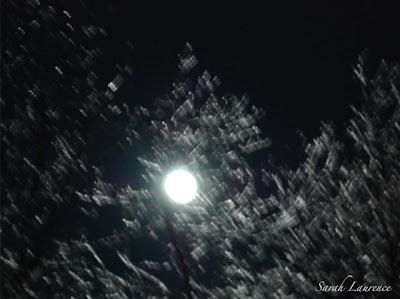 Yes, Charlotte, I shot the moon through the icy maples. I guessed on the exposure, held my breath and leaned on the windowsill. It was surreal indeed. There's a fine line between waking and dreaming so I'm glad I captured it on film. Dreamybee, welcome to my blog! I'm very careful not to get under frost-clad trees. Luckily our house has a good view of the little forest. The trees looked positively drunk. This book is wonderful. I loved it.You will too. I fell into your blog from a comment you made about books on another blog. 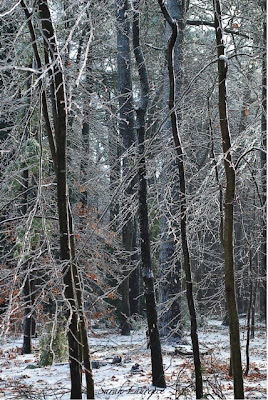 I am glad I stopped by, the photos are beautiful, I can almost hear the ice crackly as the wind blows through the branches. Yolanda, I’m always happy to see bloggers posting novel recommendations. Welcome, Sizzie, I enjoyed visiting your blogs too. I love these serendipitous connections. That’s exactly the sound the trees were making. It's quiet today after the snow. I love this post, Sarah. I want to come back and read it again when my mind isn't so muzzy. How exciting to get a new book idea! Cracking! as the Brits say. Thanks, Bee! Isn't it past midnight in England now? Sleep well. I love this post. Through the filter of photos and distance and words, you make the storm seem like a storybook day, a holiday special. Perhaps those of us who don't have to live through such weather, tend to romanticize it a bit. We've got ice now in my garden, and on my drive and on the streets. It is pretty, but oh the trouble it can cause. Thanks for sharing this look at winter in Maine for bloom day! Mss, romance is just the right word for a storm. It can be deadly but ever so beautiful. You can’t help but fall in love. Carol, thanks for hosting another Garden Blogger’s Bloom Day and for being tolerant with my bending of the rules to include this ice garden. It was so nice to see all those gorgeous southern blooms. Take care with your icy roads and walks. Luckily all our ice melted over the weekend. The new snow is far less treacherous. I am glad you made it through the ice storm. I heard that it was pretty bad in some places. I love your old stove! How wise you you all not to remove it. And in such a snug and welcoming home, I am sure it is not at all hard to welcome a little downtime. Congratulations on your new book idea! That is really very exciting, and how fun that it came on the heels of a winter storm. Beautiful! We had a Franklin stove too when I was a kid and now in England I have an Aga which I couldn't live without I love it so. Am very jealous of your "proper winter" and the prospect of a snow day! JAPRA, we had a bunch of treework done recently so nothing bad happened. Our neighbors weren’t as lucky. The new book is exciting, and it’s taking all my self-discipline to keeping going at the old book. I just finished another chapter. Thanks, Audrey. Aga’s are great for cooking in your climate. They’d make the house too warm here in the summer. I’ll be jealous of your spring in a few months. Our winters are real, but they are also really long. Thanks for stopping by my place. That poem was pulled from moth balls and I thought when I typed it that I didn't even sound like the same person any more. But, the message was the same. Love people, not things. I hope your weather is improving. The storm photos and the ice images are fantastic. Brilliantly composed and created. Sizzie, it’s calm now but more snow coming. That will be an improvement as I long to ski. I haven't been making stops at all the blogs I've bookmarked. I'm glad I found my way back here! I am home because our roads are slick with ice. We still have power, though, and the ice didn't cling to plants like yours did. It came down more in pellets. Thanks for trudging out there to get these awesome pics, and I enjoyed your commentary on the day and your ideas for your next book. Sue, welcome back! I enjoyed seeing the winter photos on your blog too. We often get ice pellets, but right now it’s just lovely snow. I love your daughter's name for her dessert, Ice Storm Pudding!! Your daughter's sense of humor and imagination is wonderful! Do you know when your book NOT CRICKET is going to be released yet? (Forgive me if you've already mentioned the release date and I missed reading the date.) I am so excited to read it! Reading your blog posts last spring and summer while you were writing it sure added to the excitement of its release! Anyway, I am anxiously awaiting it's release and as for your daughter, she certainly has her mothers creativity it seems! Kelly, I was gathering material for NOT CRICKET last academic year in England. I’m still writing the novel now. I will definitely announce on my website and blog when/if I have a book published. Thanks for your interest – that’s the best encouragement! We often lose power in the mountains in Puerto Rico but it’s not cold. When we spent a year in Tennessee, we had a wood stove that I sat in front every morning after the bus came to collect my son. The fire enhanced reflection and I wrote in my journal everyday. I remember it as a healing time. Being in the dark during the late afternoon and early evening can be frustrating. Most of my neighbors have generators. We bought a portable gas stove and many propane lamps but I never seem to maintain them well so nothing works. I just light candles and wait for the power to return all the while listening to family complaints. I hope nature’s intrusions continue to add rather than subtract inspiration. 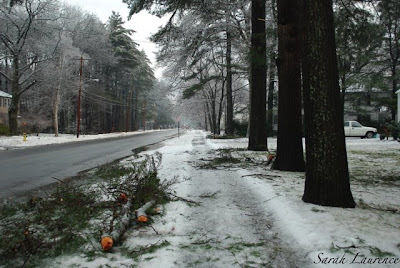 I loved your description of the ice storm and loss of power. I agree that - in the short term - it can be wonderful. After a day or so, though, it loses the romanticism and becomes hard work. I reminds me of the quote about Mainers being given the gift of not having life too easy. Cynthia, welcome to my blog and Jane’s! I’m sure she was pleased to see your comment too. That must have a big transition from Puerto Rico to Tennessee and back again. It’s good you kept a journal of it. Many of my neighbors have bought generators too, but I prefer a woodstove and lanterns. We rarely lose power for more than six hours, and generators are really loud. Get a fluorescent lantern – they are much brighter but last longer than ordinary flashlights and are easier than propane lanterns. My kids never complain about a power outage because it means no school. I can get grumpy about missing a day of writing, but I also enjoy the excuse to slow down. I'll come visit your blog soon. Mary Ellen, that’s just the right quotation! My son is out shoveling a half a foot of snow in 5 degree weather. It’s quite a winter already even a day before it starts officially. We had a serious ice storm 2 years ago, and were glad to have our Vermont Castings wood stove heat the house for the 4 days we were without electric. Some of our greatest memories are made in those times we prove to ourselves we can do without. Sara Laurence, I appreciate your interest in my life, I'm still in the Caribbean-I guess my references were muddled. I moved from Michigan to Southern Calfornia to Tennessee then to Puerto Rico. We lost power in Tennessee too but the atmosphere was different, the children were younger. Now when we lose power, usually the lights flicker, go brown, come back, then finally die. Only, sometimes they don't...so we find ourselves hoping, hoping, agh! off again! Then the computer, DVD player,and stove are gone until the power comes back again. I mentally question, Did I already cook? What will I make-in case-the power stays off? It's frustrating to lose your work on the computer, miss the end of the movie (even if you've see it before. During the summer if the power goes off we lose the comfort of the air conditioner. We are spoiled in this century! I still love living out here in the mountains though. I have my little garden projects, more time because once I come home, I stay home. When I lived in town, I'd constantly have to run errands. Plus, it's hard to say no to invitations. I like people but I need solitude to be at my best. Nina, welcome to my blog! Four days is a long time without power. 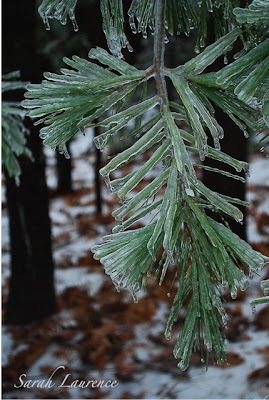 There is nothing like an ice storm to remind one of the power of nature. You show a true pioneer spirit. I really enjoyed your nature blog. Cynthia, it sounds like the solitude of mountain life in the Caribbean is worth the inconvenience of power failures. I have a laptop and a good surge suppressor so nothing gets lost. 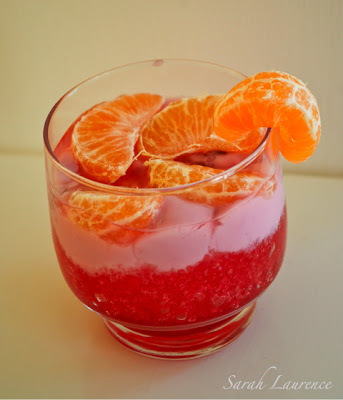 Ice storm pudding, how inventive. I remember watching the ferocity of Goan monsoons from the window, tracing bursts of lightening in the skies. From the safety of home extremes of nature make for rivetting viewing. The picture showing deep blue skies is beautiful. Anil, how right you are: a storm from inside is entertaining, but not if you are caught in it. In Maine we often get calm, clear weather after our worst storms. What a beautiful post. So lyrical and the photos added such magic. We didn't get ice on Friday. We were bombarded with snow and I loved it. 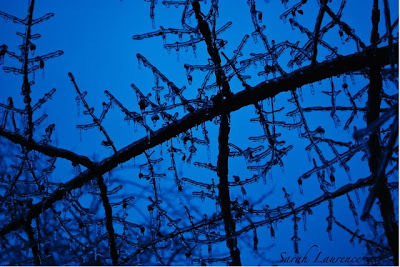 Ice storms are beautiful but they do make me nervous as a cat. To lie in bed and hear the limbs cracking like thunderclaps...not for me! Congratulations on getting a new book idea!! We never know where they will come from! Stay warm up there! Alyson, isn’t the snow marvelous? I bet your kids are enjoying it as much as mine. Pamela, the beauty balances the terror. Inspiration is as unpredictable as nature. I really like the photo of your living room with the fireplace and Christmas tree! Haven't gotten to the ice photos yet! One year, our tree was so beautiful that we left it up until March!! I think I will get one of those faux fireplaces which heat the room and don't look fake! Mantel is included! I miss having one! Cheers! Phyllis, welcome to my blog. It is nice having a fire on a cold winter’s night. I’m amazed that your tree lasted until March. Ours was dropping needles by 12th night. Randy, welcome to my blog and thank you! I enjoyed visiting your blog too. Your storm puts mine to shame. Great story!